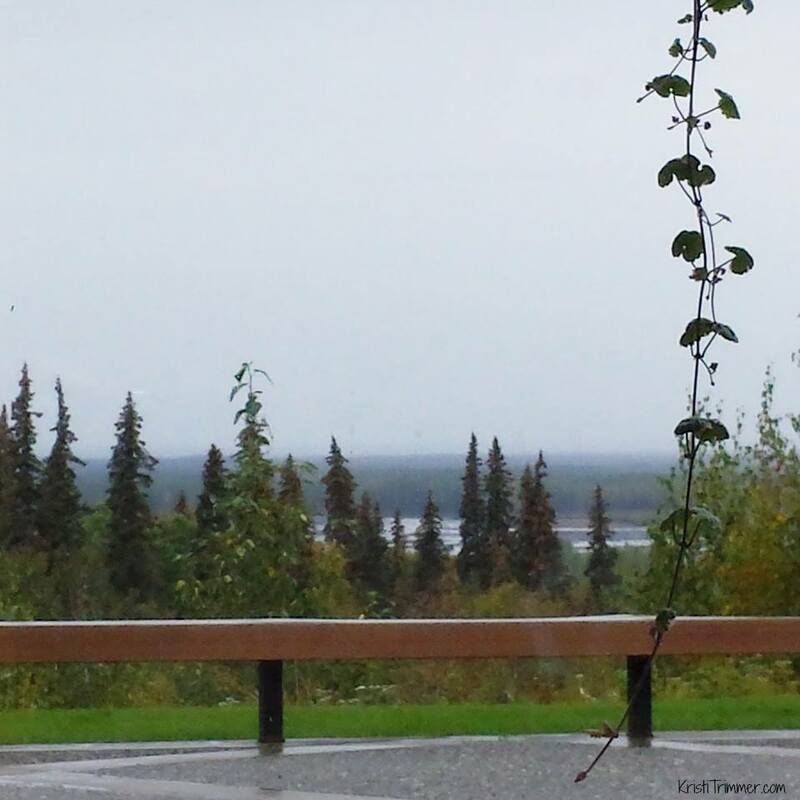 I think for a lot of us when we think of Alaska, we imagine what we saw on those TV shows Northern Exposure and Men in Trees (am I dating myself here?). A quaint little town with big trees and a river full of salmon close by with the occasional Grizzly Bear sighting. Well, that’s how I always see Alaska in my mind. It wasn’t until I visited Talkeetna, Alaska that the image I had created came to life for me. 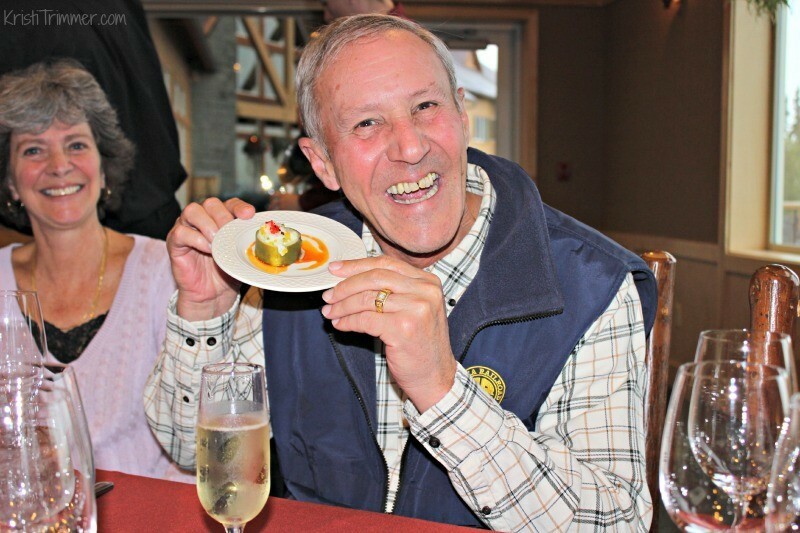 So when I was given the opportunity to spend an evening at the Talkeetna Alaskan Lodge and be a guest at their annual Fall Wine Pairing Dinner, I couldn’t turn that down. What a welcoming! It is crazy beautiful here. I honestly didn’t want to leave! Walking into the lodge I was greeted by this massive 46′ rock fireplace! 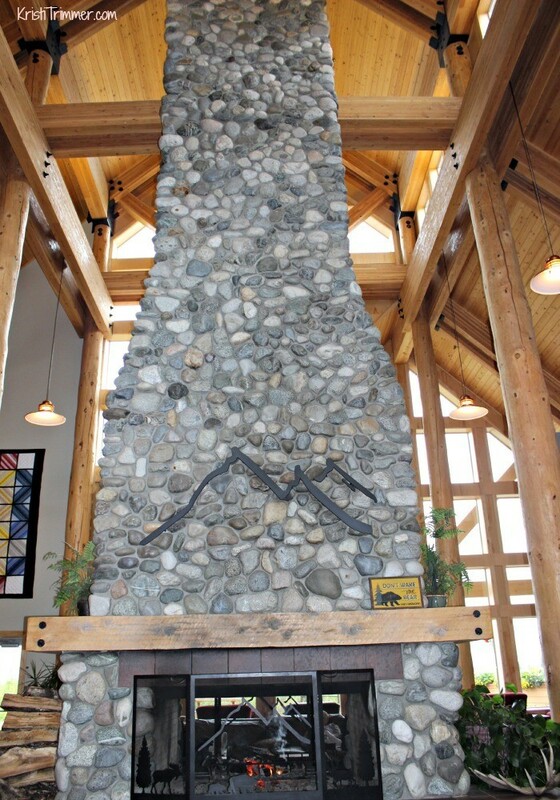 All of the rocks are from the Matanuska River and it took five workers nine weeks to build this impressive fireplace. Can you believe they built the foundation under a tent at 40 degrees below zero?!? Everything in this room comes from the surrounding areas. Those ginormous logs are from beetle-killed spruce trees from the Ninilchik area, the beautiful birch trim is from Trapper Creek and the ceiling in this Great Room is from local knotty pine. The railing from the main lobby to the third floor is white spruce from the Matanuska Valley. 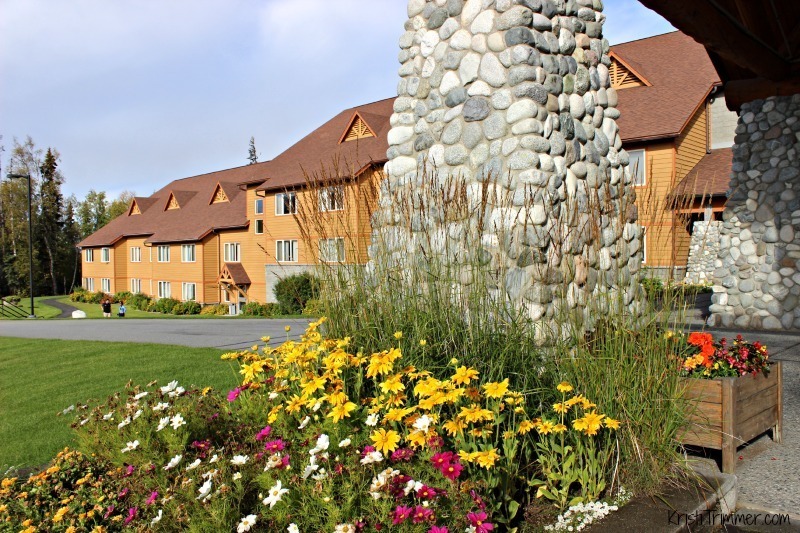 Alaskan pride is found all throughout the Talkeetna Alaskan Lodge. I loved learning that this lodge was handcrafted and you can see the beautiful work everywhere you turn. I had to lie on my back on the floor to get shots all the way to the top. It is *that* tall! Impressive to say the least! I sat in these oh so comfy leather chairs just in front of that fireplace and worked until my room was ready. This was my view. Rain was pouring down and the river was peaking out in the distance. What you can’t see in the distance is Mount McKinley because of the cloud coverage. Outside on the back of the property was this viewing deck so that when the mountain shows its massive head, you can come out and enjoy it. Only 30% of visitors ever get to see Mount McKinley, which the locals call Mount Denali. I just absolutely love this deck – I could sit out there and write all day. When it isn’t raining, of course! 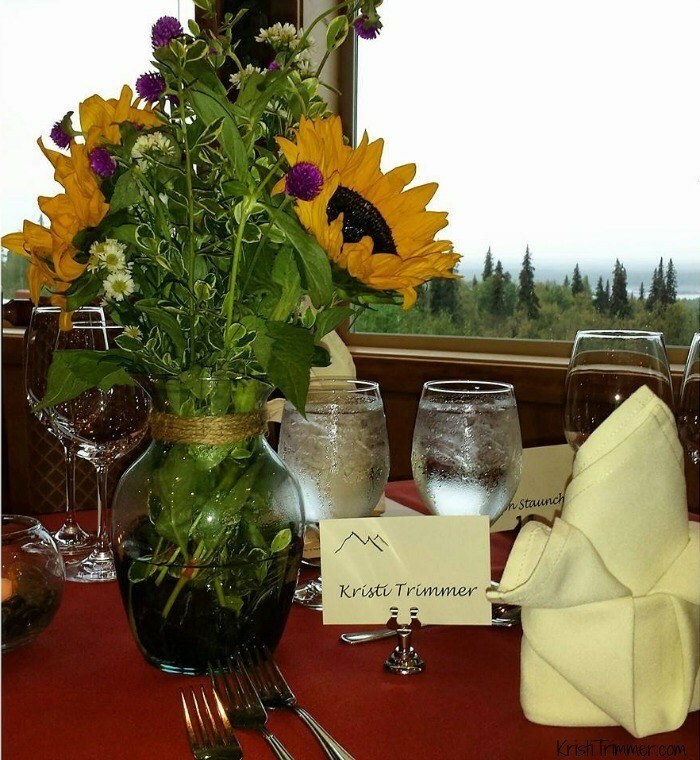 The tablescape for this event made me smile – as did the personal touches of fresh flowers and name cards. I loved the long rows of tables (I am not a fan of round tables) and the different wine glasses laid out just waiting to have yummy wine poured into them. Will you just look at all those Kenwood Wines including the Jack London series – you know this is going to be a good night!! Sommelier Solomon Loosli did one helluva job pairing these wines with the 5-course menu prepared by Chef Lanny Chin. 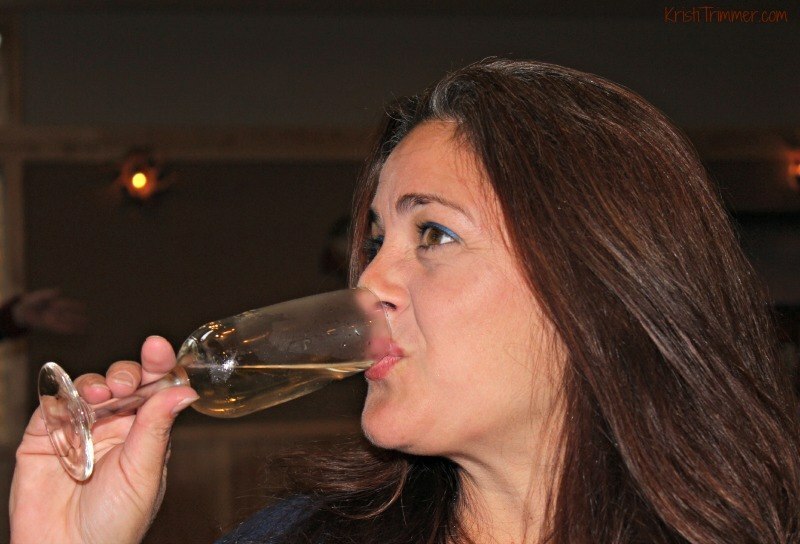 I’m hard at work here toasting off the evening with the Kenwood Yalupa Cuvee Brut that was utterly delicious. Kenwood Vineywards are in Sonoma, and you all know what a huge fan I am of California wines and bubbly! I was one happy girl! I was blessed to have met this pretty awesome couple Wally and Lois in the lobby when I was working. They were having a craft beer and talking about the breweries in Alaska – you know I had to pipe in! I thought it was pretty awesome that I was seated right next to them at dinner – and no we didn’t plan that at all. 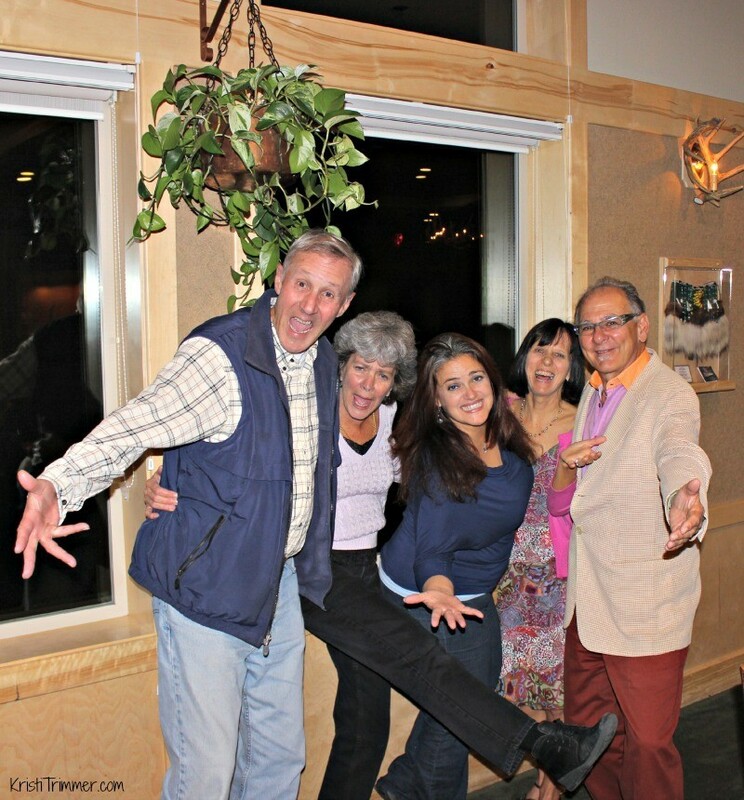 Wally not only was a retired pilot from the USAF but also an avid photographer – we talked all night long! He was a huge fan of the Halibut Ceviche that was in the center of a carved out cucumber. Hands down, my favorite course surprisingly was the Frisse Salad. Chef Lanny Chin hails from Cleveland and he said he wanted to make an impact on what he called a big kid’s Chef Salad. He wasn’t kidding! 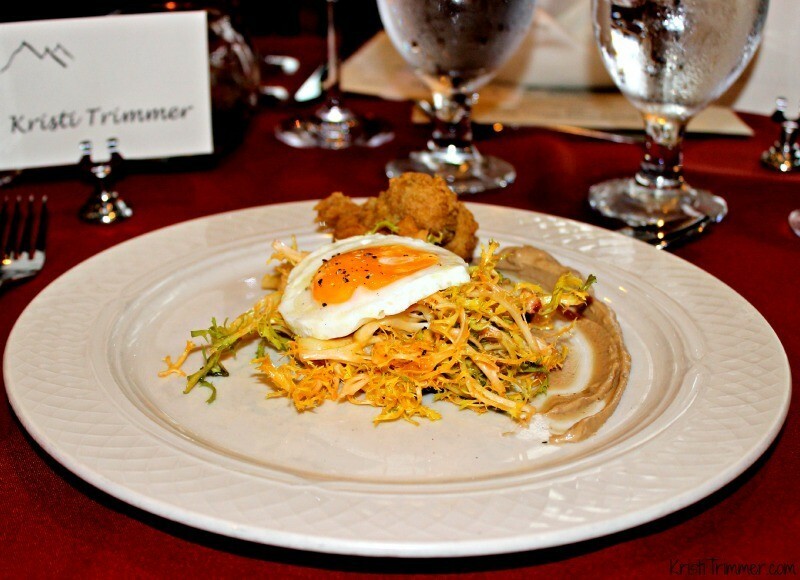 I would never have thought of topping a Frissee Salad with a poached egg and compliment it with chicken liver mousse! It was incredibly delicate and flavorful – and I am typically not a fan of anything with liver in it. It had an avocado fritter that had a flaky crust and tasted devine dipped in the tomato and bacon vinaigrette dressing and even in the mousse. This dish was paired with the Kenwood Sonoma County Chardonnay and I was in my own little slice of Heaven. The Chardonnay was light and crisp and had a nice creamy finish – just the right combination for a chardonnay. I would easily pick up this bottle again! I caught the sunset in this Jack London Zinfandel. This might be one of my favorite photos I have ever taken. It really captured the moment for me. I took this with my Canon T3i and 18-55 lens. Alaska is the king when it comes to salmon, and this Copper River Sockeye Salmon did not disappoint. It was plated on a goat cheese and pea puree that was to die for and topped with crispy local mushrooms. 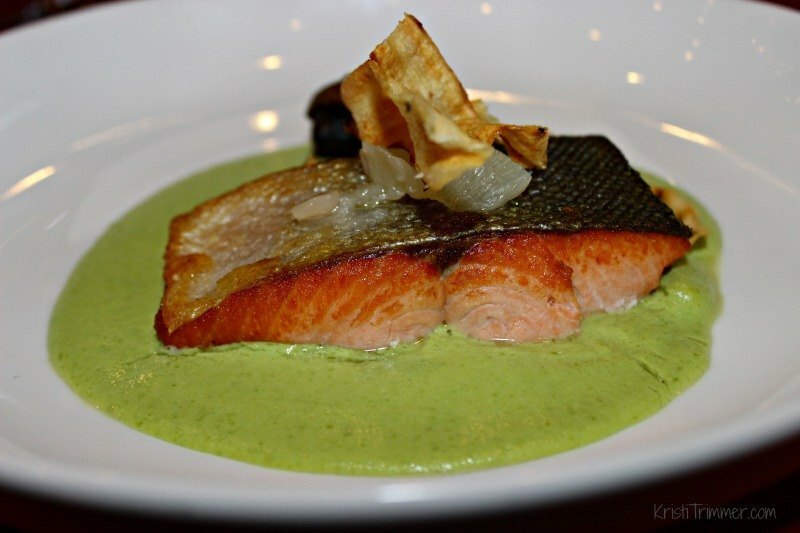 Moist, tasty, elegant… I *so* want to try and recreate this dish. It was just about perfect! 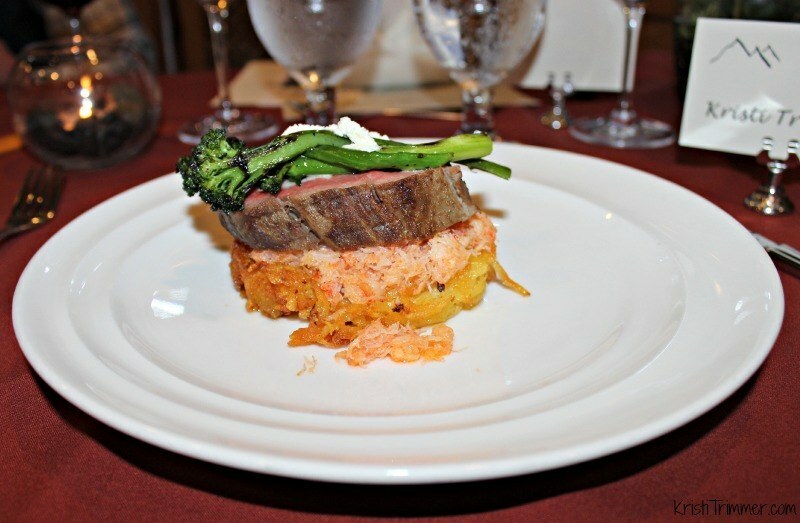 I’m not sure you could taste anything better than a Beef Tenderloin + Alaskan King Crab + Potato Cake i.e. an adult Tater Tot. I made sure to taste each of them alone but the real hero of the dish came when you added them all together in one delectable bite. Ohhh mmmm to the ggg. Couple that with my favorite Jack London Cabernet Sauvignon and I was one very happy woman. Very very happy. At this point I had saved a bit from both my Zinfandel and Cabernet Sauvignon so I could taste them side by side. I typically always choose Zinfandel over a Cab because I like a deep, dark wine that blow my mind. With Kenwood Vineyards, that award definitely goes to their Cabernet Sauvignon. If you want a red wine to knock your socks off or to enjoy while sitting in front of a roaring fire, choose this one every time. I did truly enjoy the Zin as well but would drink that when I wanted something a little lighter and more fruit forward. But tonight, my love affair was with the Kenwood Cab. If that dinner wasn’t delicious enough, they had to go and blow me away with dessert. 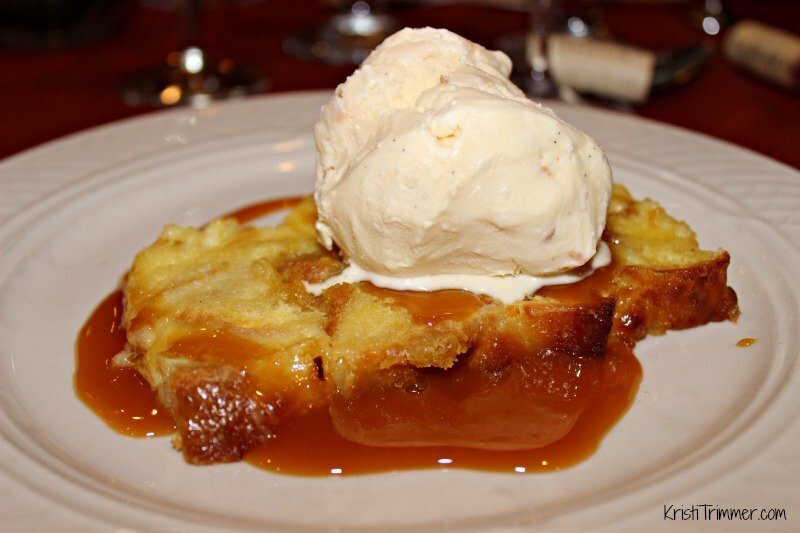 Most people know that I am not a fan of bread pudding… not one little bit. But Pineapple Bread Pudding is obviously now going to be a different story! I am a huge, and I mean HUGE ice cream lover. Give me all the homemade toasted coconut ice cream and no one will get hurt. Seriously, hand it over! Then to top it off they handed me a Kenwood Moscato Zacchera to make my taste buds explode one last time. This moscato was not overly sweet and had a slight citrus finish which kept it light and refreshing – a perfect ending to a perfect night. Hanging out with the star of the evening – Chef Lanny Chin. 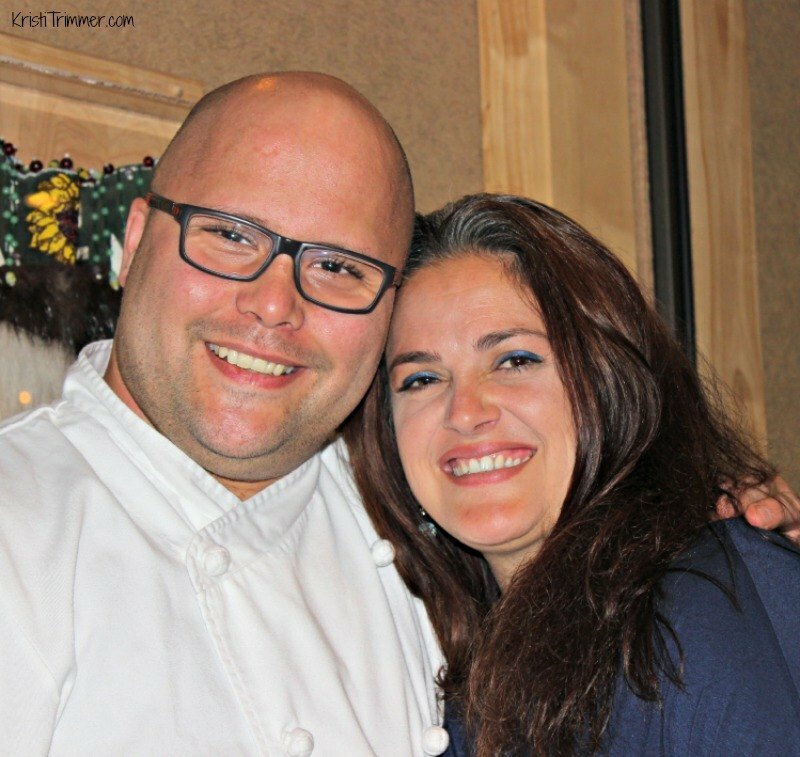 He is an amazing chef and I hope we get to stay in contact. I guess I hadn’t expected to find this caliber of food in Alaska (my mistake – obviously!!). I would go back every night of the week to the lodge for dinner! I was also very grateful for him to make some minor accommodations to my dinner to make it soy-free for me. I reached out beforehand to let him know of my food allergy and he said it wasn’t an issue. It really helped to ease my mind so I could enjoy my dinner and not worry. I can’t wait to see what the future holds for Chef Chin – he is one Executive Chef I would want in the kitchen of my favorite restaurant wherever I might be. Amazing Chef! What a great gang to hang out with all night. We laughed, we drank, we ate, we told stories, and we laughed again. 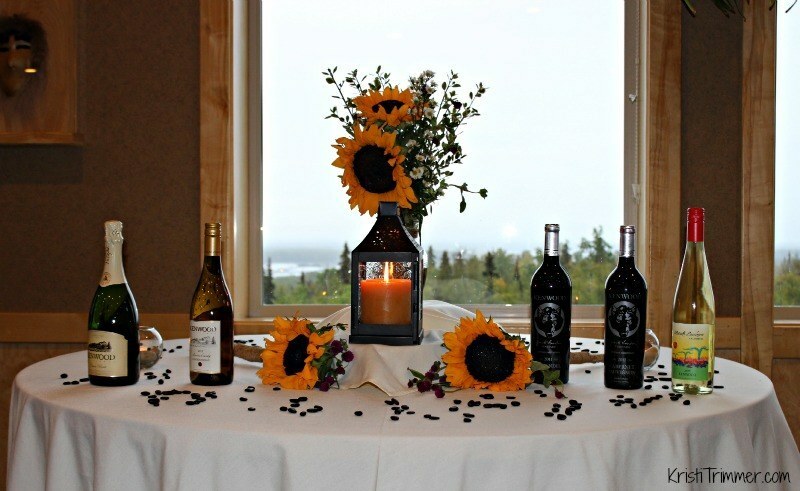 We had such a great time because the Talkeetna Alaskan Lodge sure knows something about hospitality and putting on an event – I can easily see how this event sells out year after year. No wonder they have been on the Wine Spectator’s Award of Excellence since 2003! Amazing staff, amazing property, and a truly spectacular evening! I woke up the next morning and from my room I saw Mount McKinley for the very first time. I was blown away – it was truly magnificent. I wish the pics I took from my room would have come out, but alas, they did not. 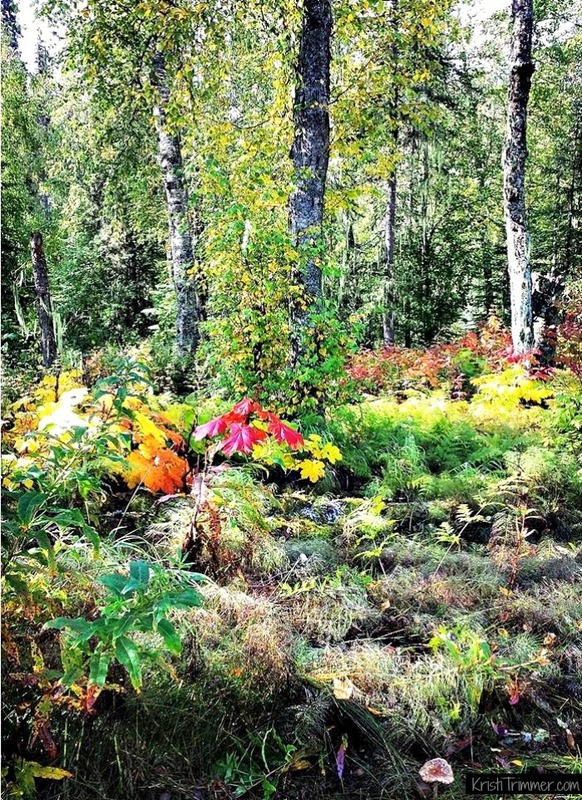 I decided to go on a 3-mile hike around the grounds and couldn’t believe all of the colors and plants I saw. And the mushrooms – so many mushrooms everywhere! One of my friend’s commented on this photo saying she was expecting a Hobbit to pop out – me too! 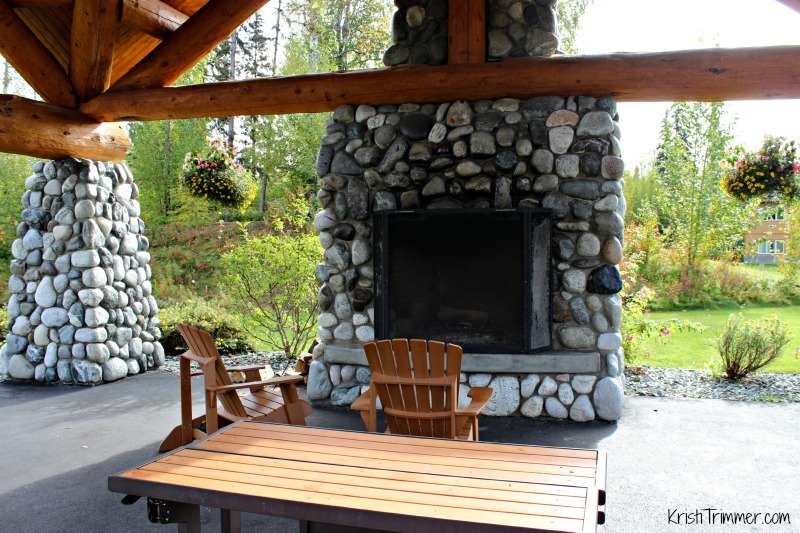 As I walked back to the lodge I found yet another fireplace – this one outside ready for anyone to enjoy. They have fireplaces with huge sitting areas throughout the lodge. You can find one to sit at all by yourself or go to the main one and meet people from all over the world. 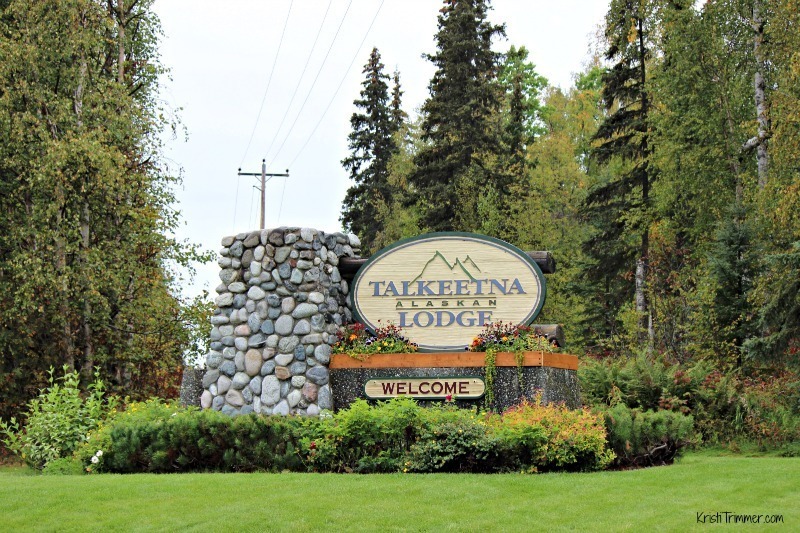 This was my last view of Talkeetna Alaskan Lodge when I checked out. Flowers blooming for the last time, people walking and talking in the distance, and a place that truly felt like it was out of a storybook. 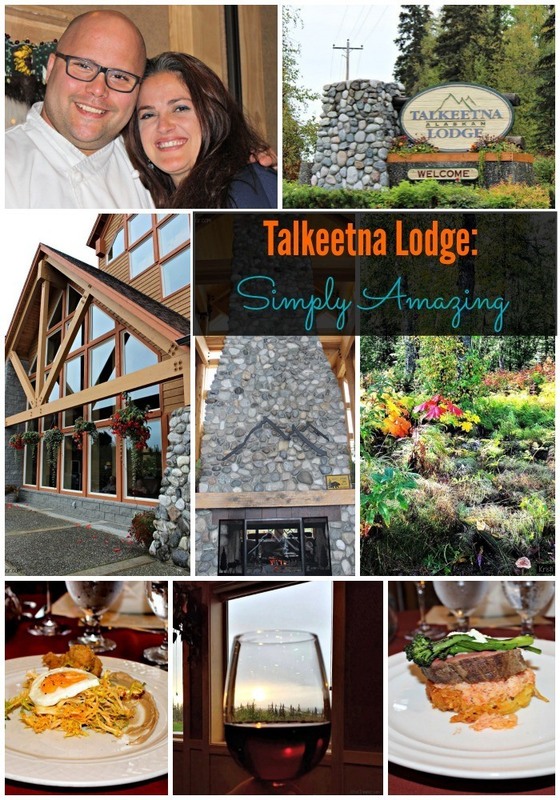 Thank you Talkeetna Lodge for inviting me to join you for your Fall Wine Pairing Dinner. I had an amazing time and can’t wait until you open back up for the 2015 season. I will be there! This place definitely found its way into my heart and is firmly on my Most Favorite Places to Visit in Alaska list! 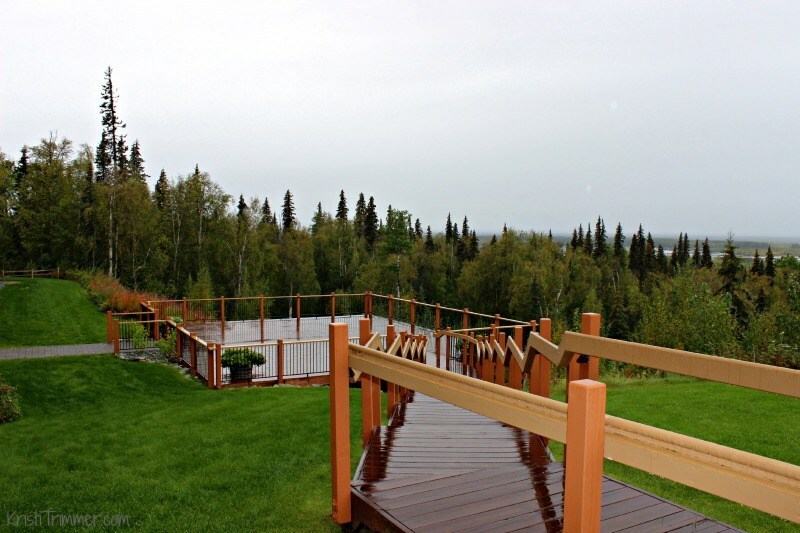 Read Tripadvisor Reviews on the Talkeetna Alaskan Lodge. 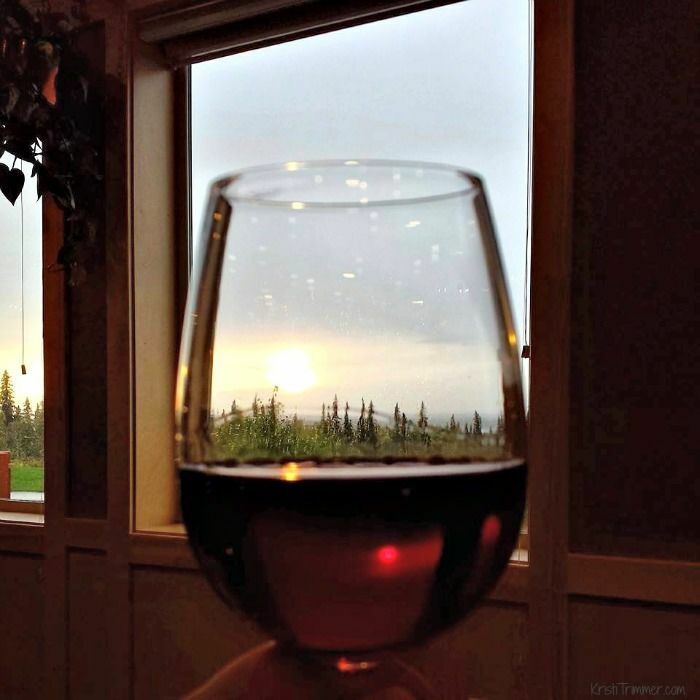 Disclosure: My stay at Talkeetna Alaskan Lodge and ticket for the Fall Wine Pairing Dinner were complimentary. I was not under obligation to write a review nor to fall in love with the property, food, or wine like I did. That just happened. And yes, I really hope I get to go back and spend more time out at the Lodge writing and enjoying that amazing view! Links within this post may contain affiliate links that I earn commissions from. Example, if you click on the above link and purchase anything from that site I make a small commission, no matter what you purchase. This is how I pay for my travels and this blog. Thank you for supporting me! I can see from the photos posted, this place is really simply amazing. If I travel to different places, I want to stay in this kind of place where there’s peace and get to relax well. This is going on my list of must sees when I do come to Alaska!! Maybe you’ll break away with me? Love your blog. Going this July and pleased to say I will be staying over night here not sure where. So looking forward to this trip. Thank you for sharing your stay.